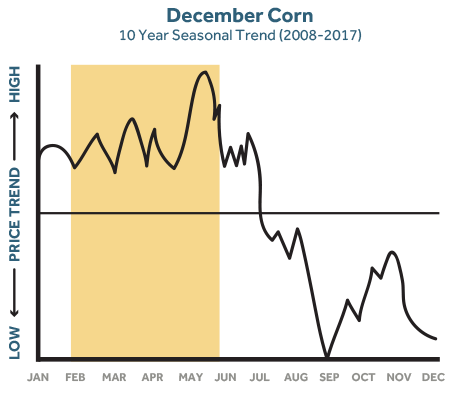 It’s no secret that grain prices are historically better at certain times of the year. 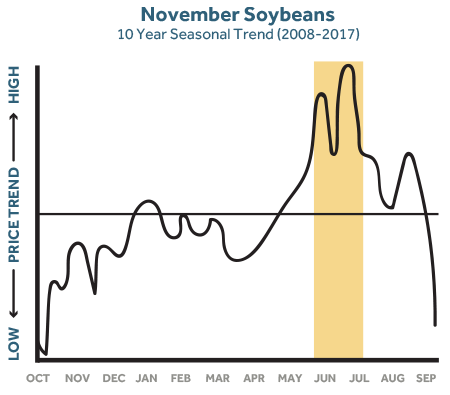 With the Average Seasonal Price (ASP™) contract, you have the opportunity to take advantage of those seasonal prices by getting the average futures price during the respective seasonal pricing window. The ASP™ pricing window helps capture the historic seasonal price premiums with automatic execution that takes some of the stress out of grain marketing. You enroll a portion of your production before the pricing period begins. An equal portion of the grain is priced every day during the pricing period, based on the Chicago Board of Trade’s daily futures settlement price for the respective futures month. When the pricing period concludes, your ASP Futures Reference Price is established. You decide when to set the basis. You deliver your grain and receive a final price. The final price is the ASP Futures Reference Price +/– Basis – Service Fee. Note: Specific dates fluctuate on an annual basis. For current dates, talk to your local ADM representative. Past performance is not indicative of future results. ADM does not warrant this information to be free of omissions and errors. Captures the average futures price during a historically “price-friendly” window. Automatically executes for you, minimizing stress and worry. Allows you to set the basis. Provides an early price-out feature so you maintain some control of your final pricing. Helps diversify your marketing plan. Establishes a challenging benchmark for the rest of your marketing.